Virtual reality is a cutting edge medium of gaming experience that gives viewers unprecedented immersion into an environment by wearing a head mounted display (HMD) and a pair of controllers. The headset tracks the viewer’s movements allowing the viewer to physically look and move around inside a virtual space. What’s cool about Virtual Reality? It’s incredibly realistic. Beyond gaming, Zion VR offers a new way to experience gaming and entertainment. Visitors will be wearing the headset to make them feel like they are immersed in the virtual reality world. The equipment will be high-tech that upon wearing the headset, you will be able to see, hear, and sense the virtual world they are in, dissociating from the actual world. But the best part: Zion VR has the technology that support room-scale. Room-Scale gives the player freedom to walk around, dodge, dive, and duck in a large area. No other Virtual Reality systems allow that freedom. 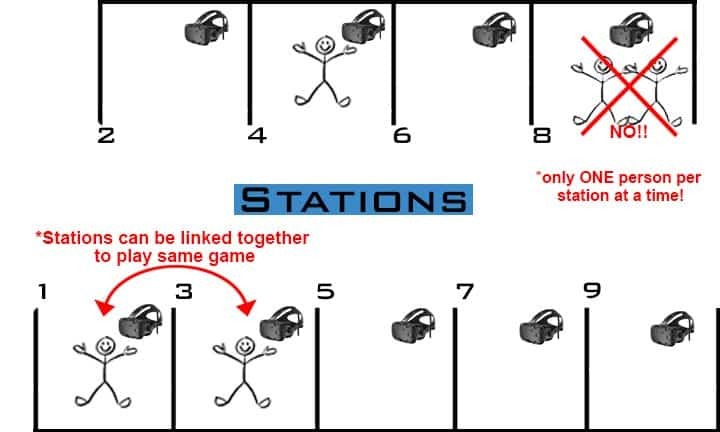 A station is a designated 8×10 feet play space that contains one headset. It can accommodate only ONE person at a time. We have ten stations total, which means 10 people can play at the same time, with one person in each station. Zion VR has the technology that support room-scale. Room-Scale gives the player freedom to walk around, dodge, dive, and duck in a large area. The equipment will be high-tech that upon wearing the headset, you will be able to see, hear, and sense the virtual world they are in, dissociating from the actual world. No other Virtual Reality systems allow that freedom. We are located at 1140 Exposition Blvd., Suite 600, Sacramento, CA 95815. In front of Arden Costco gas. Across from REI, and 3 doors down from Starbucks. Prices are located on the prices page. You get exactly one hour experience per session. You can book as many sessions as you like. We recommend you arrive 10 min before your session to check in and go over instructions. If you arrive later than your appointment time, you are not guaranteed the full hour. Please do not be tardy. We ask that you arrive at least 10 minutes early to check-in and will go through a short safety briefing. The briefing will go through equipment rules and also how to operate Virtual Reality. Can I change my game experience during the session? Yes. We developed a user-friendly virtual reality game library, so you can efficiently and quickly switch between games at your own convenience. Can I change plans or cancel my appointment at any time? at least 48 hours in advance of your booking, Zion VR will issue a full refund. at least 24 hours in advance of your booking, Zion VR will issue a 50% refund. less than 24 hours in advance of your booking, Zion VR will be unable to issue a refund. We do not issue refunds for a change of mind or gift vouchers or late or no-shows. For party packages, there is NO cancellations or rescheduling. Please email us at info@zionvr.net if you are not satisfied with your purchase so that we can resolve any problems. Bookings can only be cancelled at the discretion of “Zion VR“. Our facility has 10 stations total. Max up to ten people may at once, with one person per station. Our multi-player games range from 2-10 players, depending on the game you choose. You can book as many hours as you like. You get exactly one hour experience per slot that you booked. You must be 7 years and over to play. We do not recommend this experience to those who are pregnant, who has epilepsy or have a serious heart condition. Zion VR also provides an experience that people physically could not have otherwise. Zion VR helps people with disabilities explore the world that might be difficult or impossible in real life. It depends on the size of your glasses frame. Our virtual reality headset allows you to wear glasses if it can fit, but it can be uncomfortable as you are wearing it for one hour. We recommend that you wear contacts. There’s also the risk that the headset might scratch your glasses or our headset lenses. At Zion VR, we provide high-end computers and technology that decreases the chance of motion sickness. If there is a chance that you feel uneasy at any point, we ask that you stop and inform us immediately. There will be no refunds should you feel motion sickness during your session. Our virtual Reality system has built-in grid, called Chaperone, which shows up whenever you’re close to the bounds of your play area (the wall). Do not walk or move past the virtual reality grid. How many people can you have per station? Each station can only accommodate one person at a time. However, you will be able to share (alternate) up to TWO people only in the same station for the duration of your booking. Additional people need to book additional stations to play together. You must be 7 years and over to play. Contact us through email, phone, or even live chat.